Valentine’s Day is nearly here. Have you picked out the perfect present for your special someone? From inscribed guitar picks to a couple’s journal and a rugged cellphone docking station, we’ve rounded up eight great gifts that cost only $20 on average and are guaranteed to make his day. Please note that the prices you see below are almost always what you will find at Amazon, but that small variations do occur. Do you have more great Valentine’s Day gifts for him? Share them in comments below or on our Facebook page. 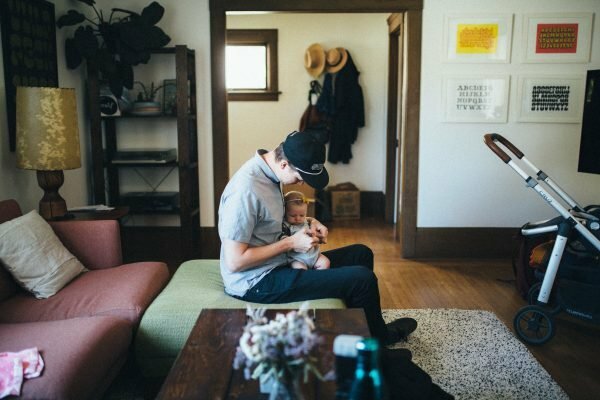 Sadie Fenton, her partner, James Edmondson, and their baby girl, Loretta, huddle in their Oakland home. As San Francisco’s cool, hip neighbor, Oakland may offer slightly more affordable home prices, but they’re still jaw-droppingly expensive by most standards. According to Zillow, the median home value is $741,900. 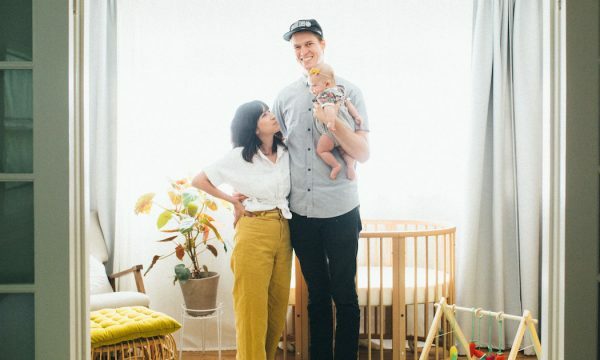 James Edmondson, 31, who runs a type design company, and Sadie Fenton, 35, a restaurant server, experienced the competitive — and often disheartening — housing market while scrambling to buy a home in Oakland last year before their daughter was born. What brought you to Oakland? Sadie was born in San Francisco, and I was born near San Luis Obispo, California. I moved to San Francisco when I was 19 and eventually transferred to an art school in Oakland. Why did you decide to buy a home in Oakland? We had been renting in San Francisco and generally felt that landlords could throw us out at a certain point. That uncertainty and dependence on landlords became less and less attractive. Some people say that renting is like throwing away money, which I don’t believe — you’re paying for a valuable service — but we were thinking about starting a family and wanted to give homebuying a shot. We checked out other areas in the East Bay, like San Leandro, El Cerrito and Berkeley, but I really wanted to live in Oakland again. I wanted a garage space, and Sadie wanted a formal dining area. We wanted a good neighborhood and to be close to shops and restaurants. I didn’t want to leave the city vibe altogether. We were flexible on the rest because we knew we had incredible competition in this market, especially at the time we were looking. We called our real estate agent at the beginning of 2018. We didn’t search very seriously the first month, but Sadie was pregnant and our due date was May 23, so that was our deadline. It ended up taking us around three months to find a home. We knew we weren’t going to get a great deal; the competition was so thick. It didn’t seem like we were going to stumble on some bargain. We looked at close to 20 houses in person and spent so much time browsing on Redfin — it took up our whole lives. We put in an offer on one house in San Leandro, but we weren’t even close to getting it. The same thing happened for another house in San Leandro. We were off by $100K. Losing those two offers was a reality check. We needed to be real with ourselves and understand that this was a ludicrous market. We ended up finding a two-bedroom in a neighborhood with a school we liked and at a price point we thought we could work with, and moved in on March 20, 2018. I think we were successful with this house and beat out five other offers because we bid almost 40% over the asking price. It wasn’t that romantic or obvious. We loved the house, but we loved a lot of the houses we checked out. Our house is busted and disgusting from the outside, but the inside is great. It’s a classic, 100-year-old Craftsman with cool details and built-ins. The kitchen is super dated and has an old-school oven range. It feels very cozy and warm; that was important to us. James Edmondson with his daughter, Loretta. Edmondson and his partner, Sadie Fenton, chose a 100-year-old Craftsman in the Glenview area of Oakland. I’m a saver. Coming into this, I had a healthy retirement account and started saving when I was 19, but I’ve since learned about the FIRE movement, and now my goal is to be mortgage-free in 10 years. I don’t care about clothes, cars, eating out or going to bars, so that helped. Our budget was initially in the mid-$600,000 range, but everything was 10-20% over asking price. We were faced with the reality that we’d have to stretch to make it work. It eventually went all the way up to $982,000, which is what we ended up paying. Sadie and I both had savings, but we also had to borrow $55,000 from my older brothers, which ended up being around 18% of the down payment. We put down around $300K, which we had saved up. The hardest part was realizing what a full-time job it is to go through the escrow process, secure the mortgage and fill out all the paperwork. It was insanely stressful. If it was just me, there’s a strong possibility I would have done a tiny home or moved to a less expensive area. It’s not necessary for everyone to go the traditional route of buying a home. But when I consider Sadie and our child, it was the best-case scenario. What advice would you give to someone considering moving to Oakland? Keep expenses low by thinking about what truly matters to you. Also have a lot of compassion for yourself. It was easy to feel stupid and stressed out during the process. I thought we were in over our heads. It’s healthy to remind yourself that buying a home is something that you will do very few times in your life. Oakland really varies. There are $4 million houses just a couple streets over from neighborhoods that are really gnarly — where you wouldn’t want to walk alone at night. …but the market may be shifting. Joyner says buyers are gradually being more selective. “There was a frenzy of people getting in and buying homes that weren’t that great, but now my clients are thinking more critically and have a more discriminating mindset. They won’t just buy anything,” she says. 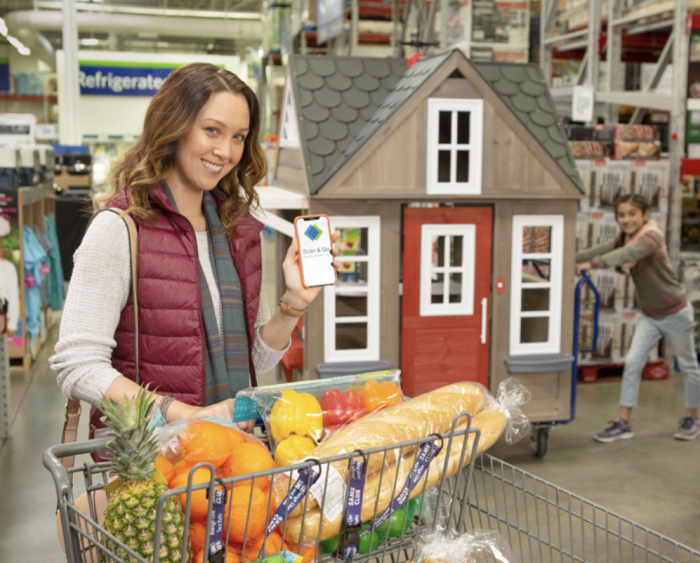 Purchase a Sam’s Club membership for $45, Get $45 back to spend in-store! Reminder: This HOT deal is still available!! Whoa!! If you’ve been wanting to buy a Sam’s Club membership, this is a GREAT deal! Right now when you purchase a Sam’s Club membership for $45, you’ll receive $45 back to spend on almost anything in-store! Note: When you sign up for this deal, you’ll be signed up for annual auto-renew. If you don’t want to auto-renew your membership after a year, just be sure to log in to your account and cancel your auto-renewal before your first year’s membership ends! Oh, the weather outside is frightful… yeah, that about sums it up. It’s winter, and it’s cold outside. To keep it warm inside means your energy bill is going to skyrocket. Plus, you’re burning energy, and that’s not good for the environment. Why not do something about that? Rebecca Rindler did. She saved $120 during a brutal New York winter last year while using energy that is environmentally friendly. Here’s how she did it. You can use your energy bill to support renewable energy — no matter where you live. With renewable energy company Arcadia Power, you can offset your monthly energy consumption with 100% renewable sources in about two minutes. Rebecca Rindler, a financial services worker living in Brooklyn, New York, wanted to be able to choose where her power came from and know that she was helping promote clean, renewable energy. The company signer her up for its price alerts program, which searched for providers that could supply her power at a lower cost. When they found one, they signed her up, and Rindler started paying less for her electricity. You, too, can help fuel your home energy with renewable sources — and possibly save some money, too, just by signing up with Arcadia. And, because you’re such a good person, the company will throw in a free $20 Amazon gift card. You can sign up to qualify for your free gift card in about two minutes. Here’s a story that might sound familiar to you. It’s the last week of the month, and you only have a few bucks left to buy food. You’ve looked for ways to stretch your grocery dollars, but you just can’t see how you can get a whole week’s worth of meals out of them. You check the pantry to see what else you have to work with, but as far as you can tell, it’s just full of miscellaneous junk — a half-empty sleeves of crackers, a few odd cans of beans, a bag of lentils you bought for some reason you don’t even remember. There’s no way you can turn that stuff into dinner, is there? Actually, there probably is. And a pantry challenge could help you figure out how. The pantry challenge is the brainchild of Jessica Fisher, who runs the website Good Cheap Eats. The idea is to buy no groceries for a fixed amount of time — anywhere from a week to a month — and make all your meals entirely out of what you already have in the pantry and freezer. It offers a way to clear the clutter out of the pantry, avoid food waste, and save money, all at the same time. It stands to reason that for every week you don’t buy any groceries, you’ll save a week’s worth of grocery money. Becky Worley of ABC says doing a two-week challenge with Fisher’s help saved her around $200, and various contributors on Good Cheap Eats say they’ve saved anywhere from $50 to $400 per month. Fisher says her yearly pantry challenge helps “even out” her grocery spending for the year, so she can afford to splurge when she needs to. Some people argue that a pantry challenge can’t really save you money because you’ve already spent money on what’s in your pantry. That’s true, but on the other hand, that money is wasted if you don’t actually use the food. Let’s face it; it’s a rare shopper who never buys anything at the store that ends up languishing at the back of the pantry. If you don’t see that as a problem, consider this: According to Feeding America, about 70 billion pounds of food is wasted in America every year, even as millions of people go hungry. By clearing out the unused food in your pantry, you’re doing your own small part to fix this problem. 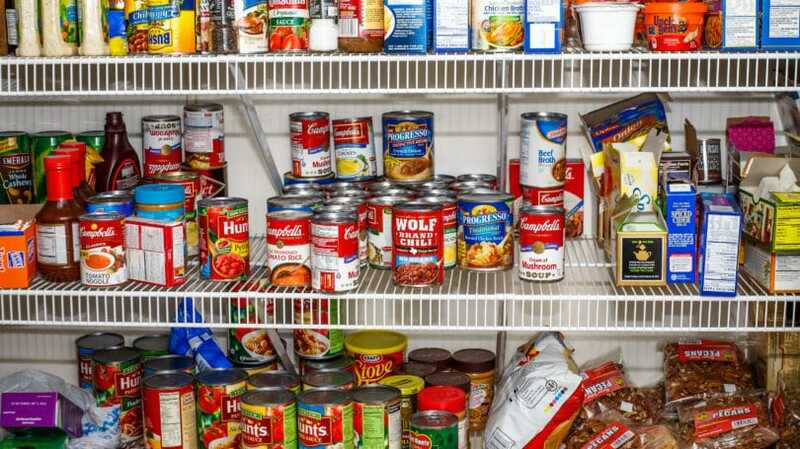 Many extreme couponers have large stockpiles of food they’ve acquired for little or no money. They often object to the idea of a pantry challenge because they’ll use up all these bargains. However, they’re looking at it backward. The whole point of buying all that cheap food was to eat it; if it just sits there in the pantry, it does them no good. This makes the pantry challenge an opportunity to make sure all those stockpiled groceries get used and to free up storage space for new bargains. Buying groceries takes time as well as money. According to a 2016 paper from the Time Use Institute, the average trip to the supermarket takes 43 minutes. That means a one-month pantry challenge could save you three hours of shopping time, which you can devote to anything you’d rather do — for work or fun. If you’re like most people, you have food lurking at the back of your fridge or cupboards that you don’t even know about. For example, when Worley dug through her pantry for the challenge, she found three open bags of flour, 27 servings of miso soup, and four bags of quinoa, which she doesn’t even like very much. 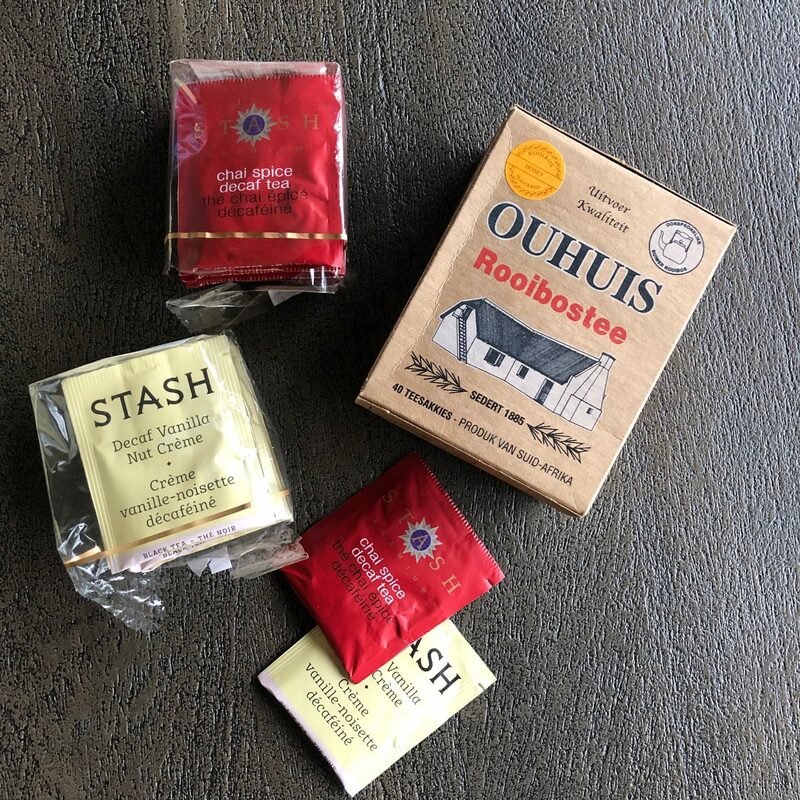 Clearing all this unused stuff off your pantry shelves makes it easier to see the food you have left, so you can find what you want when you want it. A pantry challenge can force you to try new recipes and cook with ingredients you don’t use most of the time. If your family likes these new dishes, that’s great; you can file them away as useful recipes to make in the future. However, even if your family hates some of the things you make, that’s still useful information. It will tell you which ingredients to avoid in future, so you won’t waste time cooking dishes no one will eat. 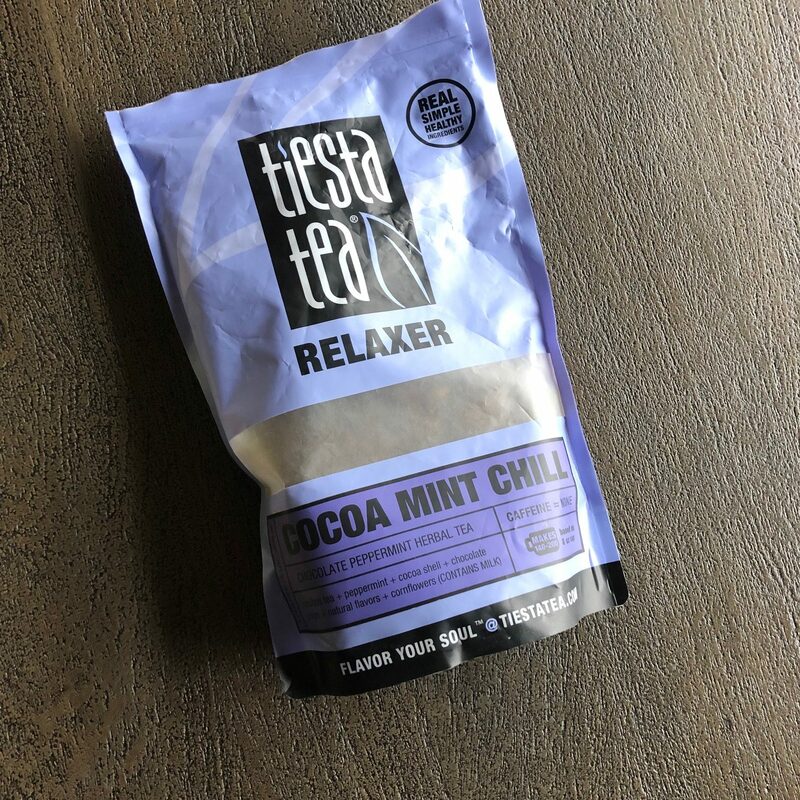 For instance, a couple of commenters at Good Cheap Eats said the challenge had taught them to stop spending money on fancy products, such as exotic grains, and stick to the basics their family actually eats. One of the biggest advantages of a pantry challenge is that it helps you sharpen all kinds of skills, including cooking, meal planning, and managing resources. For instance, a couple of commenters on Good Cheap Eats said the challenge had convinced them to try baking their own bread. Another commenter said all the cheap meals she made during the challenge convinced her that her family could get by on a smaller food budget, saving them close to $2,500 a year. In a piece for Kitchn, Fisher says many people object to the pantry challenge because it makes them feel poor. However, she says that for her, it does exactly the opposite. Reminding herself what it’s like to get by with less makes her feel grateful for what she has. Several commenters on her site have also said the challenge helped them realize just how lucky they were. Finally, a pantry challenge can be fun. Trying to make a meal out of a can of tuna, a box of oats, and a jar of peppers is kind of like solving a puzzle. It forces you to be creative, and it can give you a real sense of pride when you successfully turn what looks like a whole lot of nothing into a satisfying dinner. A pantry challenge takes planning. Since you’ll only have a limited amount of food to work with, you’ll have to know exactly what you have and what you can make from it. Here are some steps that Fisher and other people who have taken the pantry challenge recommend to make yours a success. Before you can get started on your pantry challenge, you need to know what the limits of the challenge will be. The first thing to decide on is a time frame. Fisher, who does this challenge every year, usually plans hers to last two to four weeks. However, if you’ve never done the challenge before, you might decide to do it for just one week to start. Next, decide on the rules for exactly what you are and aren’t allowed to eat during the challenge. In her ABC interview, Fisher strongly urges participants to include the contents of their fridge and freezer, as well as their pantry. That way, “it doesn’t feel like such a hardship,” she explains. Also, if you have a home vegetable garden, by all means, continue to pick and eat what it produces; there’s no point in letting that fresh produce go to waste. You should also decide whether you’ll avoid buying any new groceries at all during the challenge or just limit the amount you purchase. 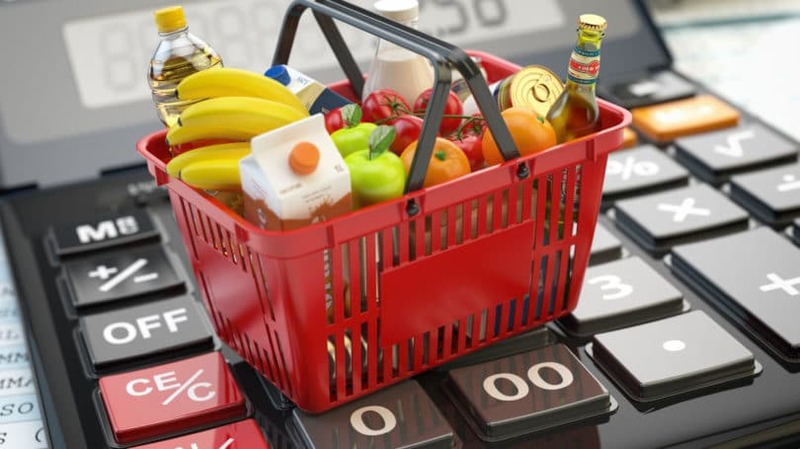 In her Kitchn article, Fisher says she doesn’t completely give up buying groceries during this period; instead, she gives herself a small budget to buy milk and fresh produce so her family doesn’t have to live entirely on packaged food. By contrast, “Tiffany” from Don’t Waste the Crumbs says she never sets foot in a grocery store during the challenge. This forces her to clean out her pantry completely, “think outside the box” when creating recipes, and be more mindful of her habits. If going entirely without groceries is too harsh for you, she suggests a compromise: Buy nothing at all for the first week, then set yourself a strict limit of $10 per week for new food after that. After establishing your ground rules, the next step is to make a complete inventory of everything you currently have in the fridge, freezer, and pantry. This step is crucial. Since you’ll be making all your meals from this food for the next week or more, you need to know exactly what you have to work with. Be thorough. Open up every cupboard, even those above the fridge that you almost never look into. Fish out every scrap of food you can find and write it down on a list, from the five pounds of chicken in the freezer to the lone packet of instant soup crumpled in the back corner of the pantry. After all, part of the point of the challenge is to use up all those odds and ends, and you can’t use them if you can’t find them. If it helps, you can turn this part of the challenge into a game. The goal is to find as much food as possible that you didn’t remember you had. If you have kids, you can probably persuade them to play along with you. With their little hands, they can reach into the smallest crevices and possibly unearth some “treasures” you’ve overlooked. Once you have a complete list of all the food in your home, you can start figuring out what to make from it. Even if you don’t normally plan your meals ahead of time, it’s essential to do it now. Otherwise, you could find yourself with five days left to go and nothing in the house but half a box of oatmeal, two packets of microwave popcorn, and 17 different sauces. Conserve Your Resources. Since food is now a limited resource for you, it’s important to use it wisely. If you have only four eggs in the fridge, think twice before blowing them all on an omelet on the first day of the challenge. Maybe it would make more sense to stretch them out by using them to make pancakes or muffins. Plan Two to Three Days Ahead. Cooking from scratch with foods from your pantry often involves extra prep time. For example, if you want to make a meal of dry beans, you need several hours to soak them and cook them. To make sure you allow yourself enough time, “Tiffany” recommends planning out every meal you and your family will eat — including snacks and desserts — for the next two to three days. After that, you can reassess what you have left in your food stores and make a new plan for the next few days. Search for Recipes. For every item on your food inventory, search your cookbook collection and the Web for recipes to use it in. Many recipe sites, such as Allrecipes.com, have a feature that lets you enter the name of a specific ingredient or group of ingredients and look for recipes that use it. It’s a great way to find uses for those odds and ends you uncover in the back of the fridge, such as a half-jar of chutney. It can also be helpful for finding new ways to use up more familiar ingredients. For instance, Worley found several cans of tuna fish in her pantry, but all she knew how to make from them was tuna sandwiches. Fisher pointed out that she could combine them with her jars of capers and olives to make pasta puttanesca, and Worley uncovered a great recipe for it online. Use Perishables First. At the start of your challenge, focus on using up the foods in your fridge that will go bad if you don’t get to them right away, such as greens and fresh milk. If you’re not sure how long your food will last, consult the food storage guide from the Institute of Agriculture and Natural Resources at the University of Nebraska-Lincoln. Sweat the Small Stuff. Tiny portions of this and that, like a tablespoon of frozen peas left at the bottom of a bag, can be particularly difficult to use up. Make a point of focusing on these odd bits when planning your meals so they don’t go to waste. A quick online search will yield lots of tricks for using up leftovers, like tossing all vegetable scraps into a soup or crumbling crackers and stale bread to make homemade bread crumbs for a casserole topping. If you have little bits of ingredients that are only slightly different, such as half-empty boxes of mismatched pasta or dribs and drabs of similar-tasting sauces, you can simply combine them in one dish. Substitute Ingredients. If a recipe calls for something you don’t have on hand, consider whether you could substitute something you do have. For instance, if you normally use cream of mushroom soup in your tuna casserole, but you’re all out, think about whether cream of celery or cream of broccoli could work instead. You can find other lists of food substitutions online. Think Outside the Box. If you think of dinner as a hunk of meat on a plate with sides of vegetable and starch, it’s time to broaden your horizons. Dinner can be a one-pot meal, a hearty soup or salad, or just a plate of sandwiches. Foods you think of as breakfast dishes, like omelets or pancakes, can also be dinner fare. Worley tried this as part of her challenge, and her kids loved it. Don’t Use What You Hate. It’s possible your pantry holds a few ingredients that you tried once and absolutely hated. Using these up could mean choking down meal after meal of something you can’t stand, and you’re likely to get so frustrated that you quit the challenge early. Giving these unwanted foods to a friend, donating them to a food bank, or tossing them in the compost bin is a better way to get some real use out of them. If you find yourself stuck for ideas during your pantry challenge, it can help to talk to other people who have done it before. Fisher sells an e-book all about the pantry challenge on her website for $12, but if you’d rather not spend the money, you can consult her free archived articles about the challenge. You can also sign up to receive emails during her pantry challenge months with tips and tricks for doing your own. While you’re reading through articles on Good Cheap Eats and other sites, check out the comments below each article. Lots of people have used this space to share their own experiences, including both their triumphs and the problems they ran into. You can post your own comments here to ask questions and get feedback from the community, or to share strategies you’ve discovered that could be helpful to others. Soups. According to Fisher, “Almost anything can be made into soup.” To illustrate this point, she has a flexible recipe called Stone Soup, based on the children’s story about a traveler who feeds a whole village by tricking the villagers into adding their hoarded food scraps to a “magic” soup pot. 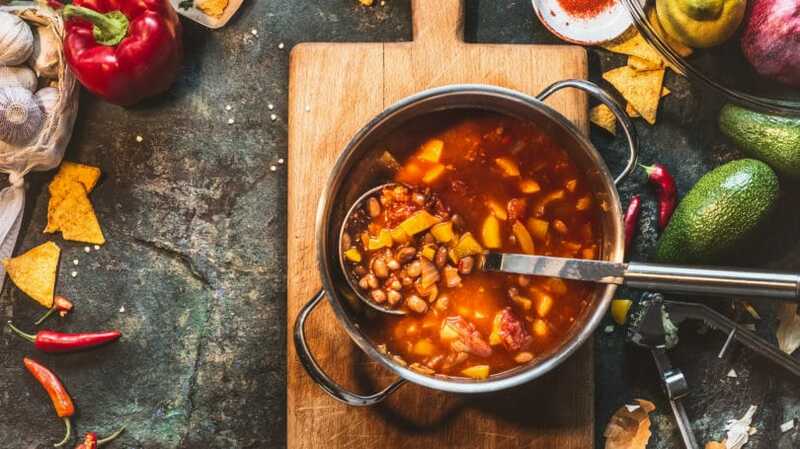 This recipe calls for a few specific ingredients, but she encourages you to “tweak” it to include any combination of broth, veggies, starch, meat, and beans you have on hand. Other soup recipes you can modify to fit your particular needs include chili and minestrone. Baked Goods. If your pantry contains a bag of flour and some leavening, this opens up lots of food options for your pantry challenge. You can bake bread or biscuits to accompany soup, make your own pizza crust and top it with whatever you have in the fridge, or make pancakes or waffles with either sweet or savory toppings. You can also bake cakes or cookies for dessert, which Fisher says “makes any odd meal go down better.” She offers a recipe called Mix and Match Muffins that you can make with any type of flavoring, including nuts, chocolate, and fruit. Meatless Meals. Unless you have a lot of meat stored in your freezer, you won’t make it through the pantry challenge without eating at least a few meatless meals. Instead of feeling deprived by this, you can look at it as a chance to test-drive a vegetarian diet, which is generally cheaper, healthier, and more environmentally friendly than a meat-based one. By discovering vegetarian meals you like, you can enjoy these benefits on a regular basis when the challenge is over. Some meatless meals to try include beans and rice, omelets, veggie pizza, and burritos. Fisher has recipes for all of these on her site, and you can find numerous others with a simple online search. Meat-Light Meals. If you can’t face the idea of eating completely vegetarian for weeks on end, look for recipes that can stretch the meat you have so it will last longer. For instance, you can add small bits of meat to soup, stir-fry, or tacos. If you have recipes that call for ground beef, such as lasagna or chili, Fisher suggests cutting the meat by half and bulking up the dish by adding extra rice, potatoes, or beans. Leftover Concoctions. Finally, Fisher has several suggestions for turning leftovers into new dishes. In addition to her Stone Soup recipe, she proposes omelets, fried rice, pizza, sandwiches or wraps, hearty salads, quesadillas, pot pie, burritos, and pasta. You can find recipes for all of these on her site and many other cooking sites. A few other flexible recipes for using up leftover scraps include quiche, frittata, casseroles, and kabobs. Better still, the challenge can be a chance to develop new habits that continue to help you long after the week or month is over. After a few weeks of cooking from scratch, using up leftovers, and keeping a sharp eye on what you have in your pantry and freezer, you’re likely to find yourself continuing to do these things even after you start grocery shopping again. You’ll continue to spend less money and waste less food; you just won’t have to challenge yourself as much to do it. Have you ever done a pantry challenge? How did it work out for you? Trying to follow your food strategies but I have a very picky 6 year old and a picky 2 year old at our dinner table. They refuse to eat most things that are put in front of them and insist usually on a certain kind of mac and cheese that’s not the cheapest. Thoughts? When our children were younger, they were somewhat picky, though they grew out of that pickiness over time. Our strategy for picky eating children was to simply prepare and serve the meal before bringing them to the table, which meant that they could decide for themselves whether to eat what was before them. This eliminated the sense that they could dictate what they were served at meal time. Since the food was already on their plate when they sat down, they lost that sense that they could dictate what was being prepared, which helped a lot. Another strategy we adopted was to not worry too much about how much they ate at meal times. If they didn’t eat, it was okay; they would eat when they were hungry. Of course, that often meant that they were snacking, so we intentionally kept healthy snacks within their reach and unhealthy snacks way out of their reach. The fruit bowl was easily accessible, as were the bananas. The cookies? Not so much. We would sometimes have meals that they loved, but most of the time, we prepared typical meals bought with low-cost ingredients. We did not let their tastes dictate our meal plan. What dictated our meal plan was low cost and healthiness. Another strategy we found that worked well was asking that they simply eat one “real bite” of anything that they were served. That way, they could decide for themselves if it was good or not. If they ate a real bite, chewed it up, and swallowed it, we wouldn’t ask them to eat any more if they didn’t like it. In short, part of our success with having a variety of foods at home when the kids were little was to simply find subtle ways to nip their complaints in the bud before the complaining ever had a chance to begin. If supper is already on their plate before they even think about it or get to the table, there’s not much they can really do about it. If we only ask them to eat one bite, it’s not that big of a deal – it seems far less cataclysmic than having to eat a big pile of some weird food. As our kids got older, we gradually realized that just because we were having dinner didn’t mean that the kids were hungry right then. Often, most of the disagreements about food came from the fact that they weren’t actually hungry at all when they were being plopped down at the table and told to eat, so they’d complain about any food that wasn’t something they loved. You can’t expect a kid to be hungry when you want them to be hungry, after all, and forcing them to stay at the table under the idea that they’ll eat someday creates unnecessary conflict. Staying at the dinner table when they’re older is another matter, as you’re teaching polite behavior in society, but that’s not a useful lesson to a two-year-old. So, here’s what I’d recommend if I were you. Step 1: Get a grocery store flyer. Step 2: Find sales on fresh ingredients. Step 3: Do some recipe research. Step 4: Create a week-long meal plan. Step 5: Make a shopping list from the meal plan. Step 6: Go grocery shopping – and stick to your list. Our meal planning starts with grabbing a grocery store flyer from which we identify items that are on sale. We then base our meal plan for the week on those on-sale items and then prepare a grocery list from that meal plan (which means the grocery list is automatically full of on-sale items), after which we just go to the store and stick to the list. As you’re following that plan, you should, of course, keep what your family likes in mind, but that doesn’t mean it has to dictate all of your meals. Naturally, if you see some of the ingredients of a meal that your children love and they’re on sale, you should pick those up. However, that shouldn’t dictate your full meal plan, nor should it. You should choose other meals that involve on-sale elements and serve them as described above, putting them on the table and on their plate before they even sit down at the table. Another good strategy is to stock up hard on a family favorite if you notice that it’s on sale. If you do see the kind of mac and cheese that your children like on sale, stock up. Buy several boxes of that macaroni and cheese at once and stow it away for future meals. Since it’s essentially nonperishable, you don’t have to eat it every day. We do this with quite a few items at the store. Things like canned diced tomatoes, dry beans, dry rice, and flour are always bought in large quantities (as are virtually all household supplies). When it actually comes time to prepare a meal, just prepare the whole meal and put some on their plate before bringing them to the table. Don’t discuss what you’re having beforehand – if they ask, just tell them briefly and matter-of-factly and leave it at that. Most of the time, they won’t pay any attention at all unless they’re really hungry. If they don’t want to eat what you made, simply say, “If you eat one bite of each of those things, you can get down and play and Mommy will be happy.” This worked wonders for our kids. Often, as I noted earlier, they just weren’t hungry at meal time and directed that toward not liking the food. Some kids are simply “grazers,” and the best way to handle that is to just have plenty of healthy snacks around. Keep apples and bananas on hand and make it clear that those are their snack time choices. Don’t make cookies and candy available with ease – not only are they unhealthy, they’re more expensive than apples and bananas. These were the strategies we used when our kids were younger and it worked well. Our kids are pretty adventurous eaters these days now that one’s a teenager, one’s a pre-teen, and the other one is in upper elementary. They like things like sushi and lychee and kimchi and pickled garlic and curry, believe it or not, and they’re pretty happy with almost everything we make for dinner. 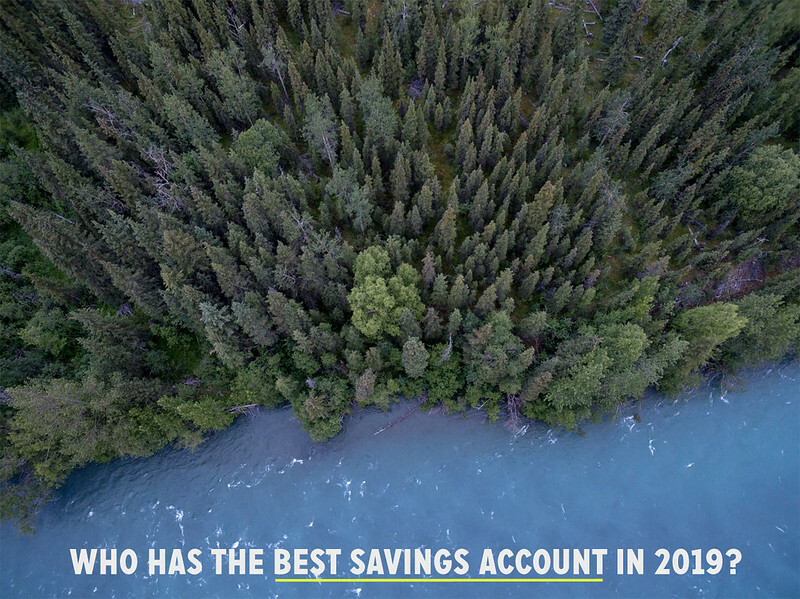 Who has the best savings account in 2019? Well, my friends, I need your help. I had been planning to research online savings accounts for an upcoming series of articles, but not for several weeks yet. Things have changed. I recently received a $35,000 lump sum — I hesitate to call it a windfall for reasons that will be clear in a moment — and now I’d like to put it somewhere that I can earn more than 0.01% on my money! I want to find a good high-interest savings account. But where? In 2019, which online savings account is best? Am I asking the right question? Is an online savings account the best place to put a mound of money like this? First, let me explain why I’m even interested in finding a new savings account. As I’ve hinted a few times during the past month, in 2017 and 2018 I made three $50,000 investments in start-up companies. I dabbled in “angel investing”. Early last year, I made a third investment. I have a friend who is whip-smart and ultra-successful. She’s started a couple of profitable companies in the past. She and her husband thought they had a great idea for a third, and although this particular concept was outside my area of expertise, I agreed to invest $50,000 in their company. Well, things didn’t go well. The company failed. I was afraid that with that failure, I’d lost all of my money. Fortunately, I hadn’t. Earlier this month, I received a wire transfer for $34,869.73. After transferring $5000 to my business account (to help pay bills for this site! ), I’m left with about $30,000 that I’d like to sock away somewhere that pays more than pennies. But where? Based on reader feedback from that article — over 1000 responses! — I opened an online savings account with ING Direct. They didn’t have the best interest rates the time, but their rates were very good and GRS readers loved them. As you probably know, things have changed in the past decade. Interest rates are lower. Banks have folded or merged or been bought out. As you can see, I’m earning 0.99% on my money. That’s a lot compared to, say, a standard savings account at a brick-and-mortar bank. (I was mortified to learn recently that the family business has over $200,000 earning only 0.01% at a major national bank. Holy cats!) But 0.99% seems low for an online savings account. It’s certainly not the best interest rate that’s out there. The company that used to own this website — with whom I still have a business relationship — has a handy tool that allows folks to look at a lot of today’s top online savings accounts. Naturally, this is going to be a starting point for my search. Those rates are much better than my current 0.99% interest rate at Capital One 360. But I don’t know anything about these banks (except HSBC). I haven’t heard personal reviews from friends, colleagues, or readers. Plus, I don’t know if these are the best interest rates available. I want to use this $30,000 to fund the next few months of my life. (I’d love to say that this money will last me a year, but it’ll be more like six to nine months.) And now that I’m working again, I’d like to explore various saving options. Naturally, I’m going to conduct research of my own. Most of my colleagues maintain lists of current bank rates. I’ll do a deep Google dive to discover more obscure banks and credit unions. I’ll investigate those “fusion” accounts that pay high interest rates if you jump through hoops. My girlfriend is a huge fan of Ally Bank, and she proselytizes for them whenever she can. (I am not joking.) I see they’re currently offering a 2.30% 11-month no-penalty certificate of deposit. (Their savings account interest rate is 2.20%.) I’ll certainly check them out, but in the meantime I’m polling the GRS community. I have no doubt that many of you money bosses actively watch bank rates and features. I suspect you have favorite online savings accounts. Or money market accounts. Or certificates of deposit. Or whatever. I’m hoping you can help me! Which online savings account is best right now? 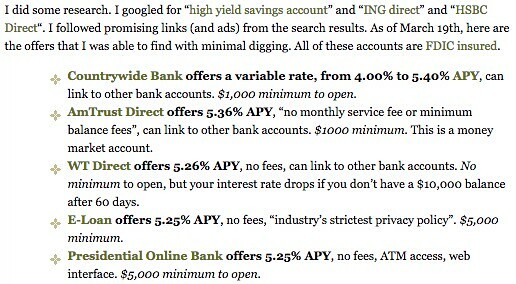 Which online savings account to you use? Which should I use — and why? Based on your responses here (plus the responses I get on Twitter, in the GRS Facebook community, and from the GRS email list), I’ll look at a variety of different options. And have no fear. I’ll report back in a week or two to share my decision and I’ll collate a list of the best savings accounts according to you folks. In 2006, J.D. founded Get Rich Slowly to document his quest to get out of debt. Over time, he learned how to save and how to invest. Today, he’s managed to reach early retirement! He wants to help you master your money — and your life. No scams. No gimmicks. Just smart money advice to help you reach your goals. If unsolicited phone calls are driving you batty, T-Mobile and Verizon are rolling out new technology that might be too good to resist. The mobile phone service providers each are introducing their own technology designed to keep robocalls and scam solicitations at bay — for free. T-Mobile’s Caller Verified feature subjects incoming calls to a verification process. If the technology determines that a call is authentic — not intercepted by scammers or spammers — customers will see the words “Caller Verified” on the incoming call screen. Caller Verified is free, and is available now for all T-Mobile customers with the Galaxy Note9. It will be available for more smartphones as the year progresses. Not to be outdone, Verizon has announced that in March, it will begin offering its spam alerting and call blocking features for free. These features will be available to all customers with smartphones — including iPhone and Android devices — that support the features. Verizon says more information about how to sign up for the features will be released as their launch nears. T-Mobile and Verizon aren’t the only wireless carriers that offer services designed to screen or block unwanted calls. Sprint, for example, introduced Premium Caller ID back in 2016. The feature identifies callers who are not already in your contacts, and on some devices it also provides enhanced spam identification features, Sprint says. Premium Caller ID is not free, though, and currently costs $2.99 per month. Sprint customers can also block specific phone numbers through their My Sprint account. AT&T offers AT&T Call Protect. The company says this service detects and blocks calls from likely fraudsters and identifies calls from telemarketers and suspected spam calls — among other features. AT&T Call Protect is not free, either, though. It currently costs $3.99 per month. There are plenty of things you can do to block or reduce robocalls, no matter which wireless carrier you use. The federal government maintains the Do Not Call Registry, however, so you’ll have to wait until the partial government shutdown ends to sign up for it. How do you fend off robocalls? Share your tips in comments below or on our Facebook page. Your estimated savings amount (the amount of interest you’ll save over the life of a loan) is the difference between your student loan interest rate and interest rates from our loan partners. We estimate your interest rate by looking at your total monthly student loan balance and monthly payments as identified on your Trans Union credit report. Your interest rate and total savings may vary. Your eligibility for any specific loan rates and terms depends on verification of information, your credit history, and other factors as determined by lenders. NerdWallet does not guarantee that you will be able to obtain the Estimated Savings or that any lender will extend you credit. Interest rates are subject to change daily without notice. NerdWallet does not take student loan applications, originate, service, or make credit decisions in connection with loans, nor does it issue commitments or lock-in agreements. See your lender’s Terms for more information. 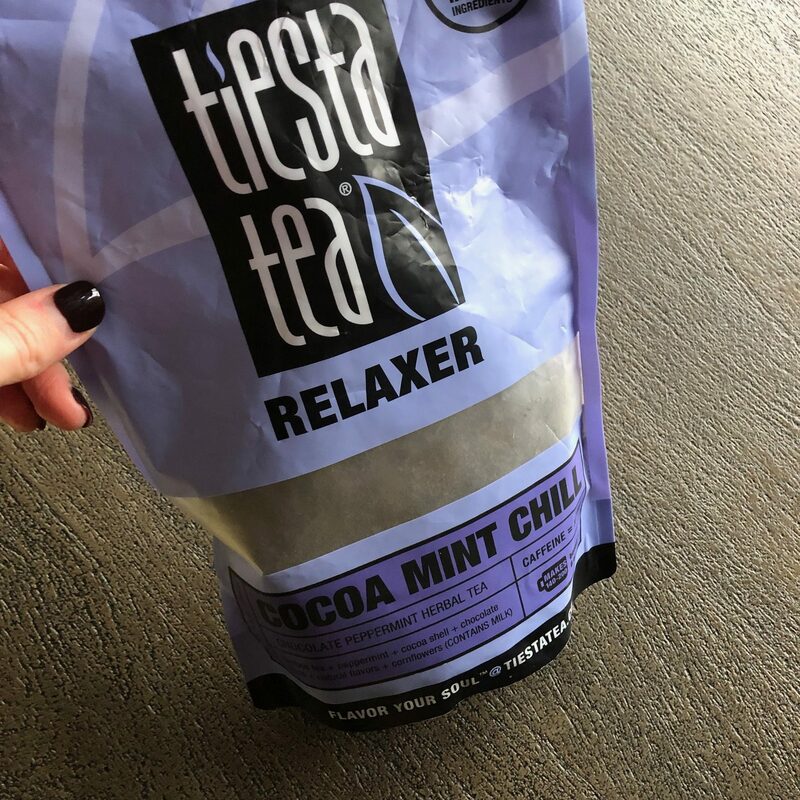 As most of you know, I stopped drinking coffee a few years ago… and it’s been the best thing ever! My anxiety is so much better, I sleep so much better, and I’m just all around healthier. 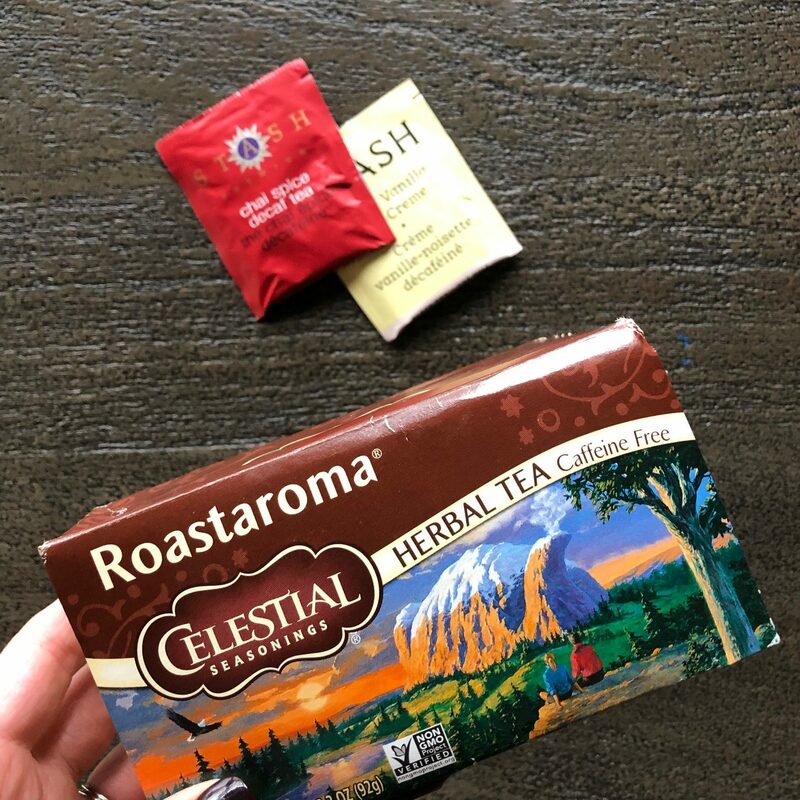 Instead of drinking coffee, I have fallen in love with decaf teas. 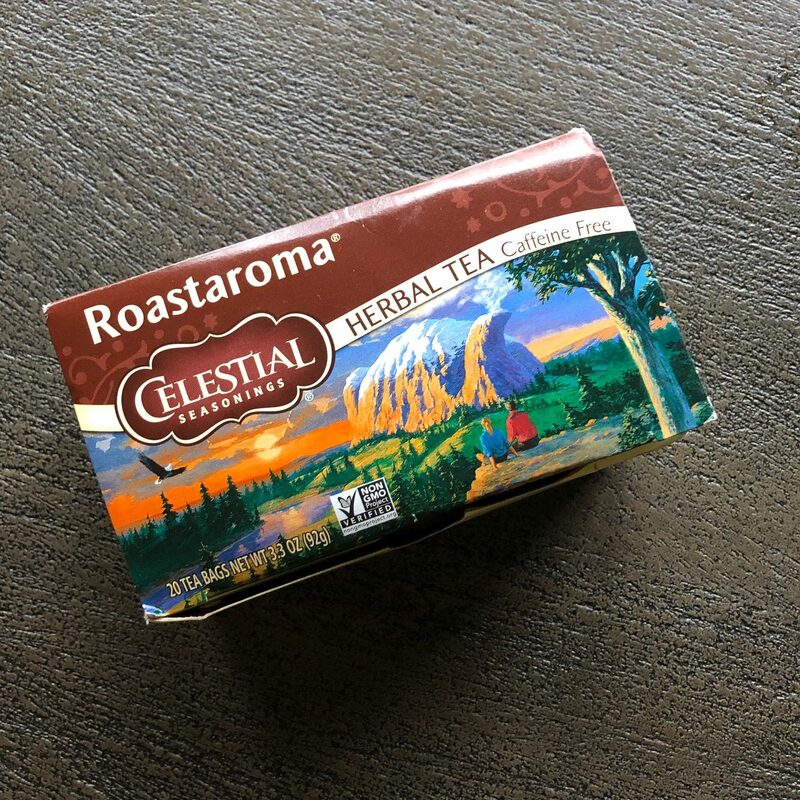 Many of you have asked for me to share what my favorite teas to drink are, so I thought I’d list them here, for anyone who is interested. Want more details on this journey? You can watch my video on Why I Stopped Drinking Coffee and read about How I Drink a Gallon of Water Every Day. 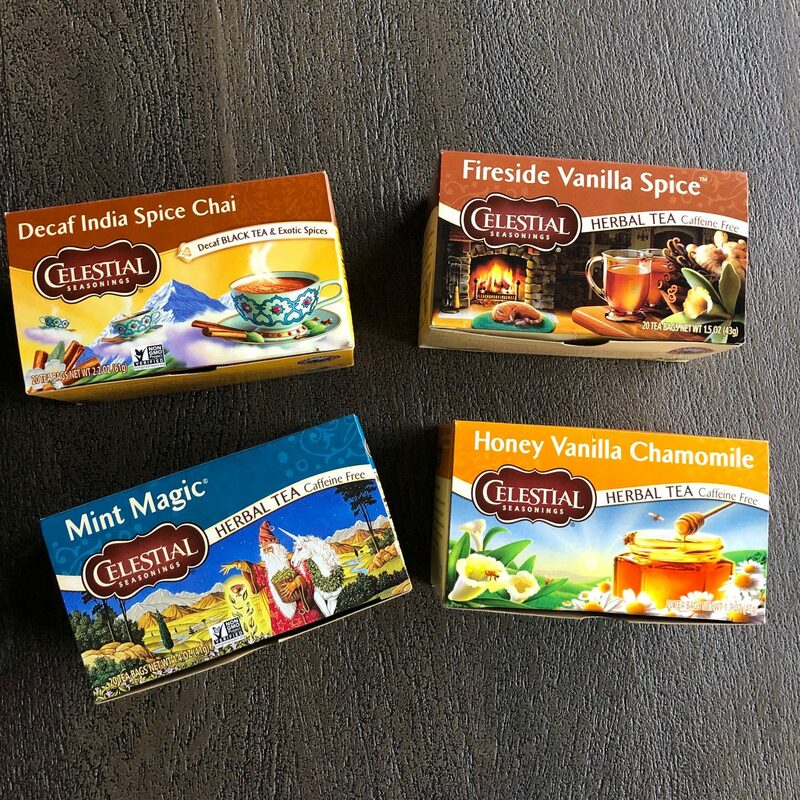 What are YOUR favorite decaf teas? Any recommendations for me? I’d love to hear!